I noticed on our Flickr page that Thalia has mocked up an diagonal chain in alternate blocks, which looks good. A nice way to unify some very different blocks. 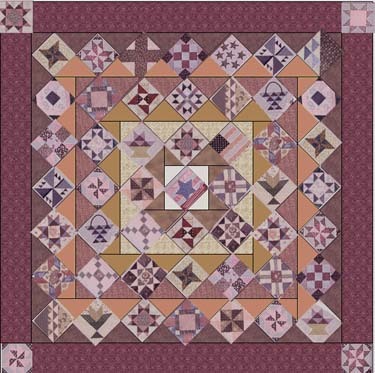 And Magpie Memories is going to use the same set she used in her "Sylvia's Bridal Quilt." I thought about a medallion kind of format. Sorta like this. All 53 blocks fit. The quilt is a little bit more than 95" square and it's easier than it looks because it's really just an alternate block set with the blocks on point. 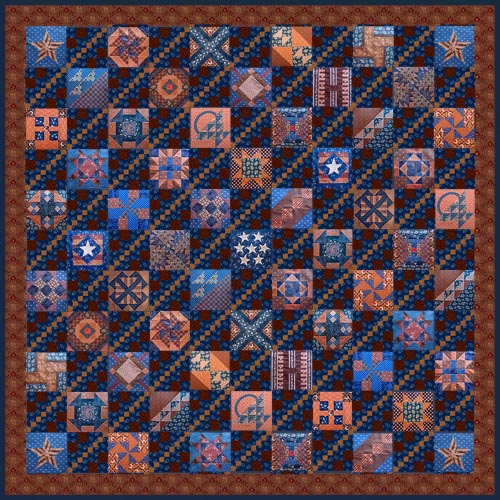 I was inspired by this quilt that Terry Thompson and I did years ago for one of our Moda Civil War repro lines. The pieced blocks are white squares in this mockup. The quilt is a grid of 7 x 7 blocks on point. The border finishes to 8" with four pieced blocks in the corners. This is the alternate block (A) finishing to 8". 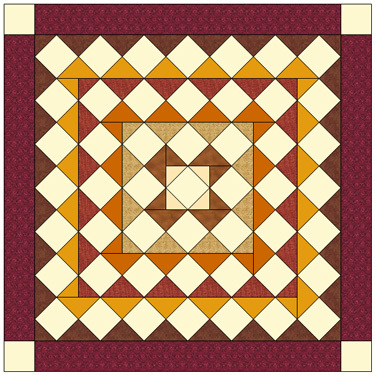 Cut squares 8-7/8". Cut each in half diagonally to make 2 triangles. 8 shaded in a palette 2 for the middle ring. To get the medallion shading you need a second alternate block (B) to turn the corners. 4 shaded in palette 3 for the center ring. Piece them as they are shaded above but you have to rotate these to get the medallion illusion. 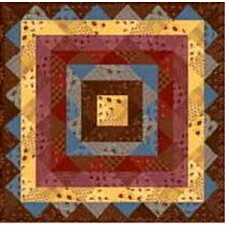 Cut the large triangles by cutting squares 8-7/8". Cut each in half diagonally to make 2 triangles. Cut the small triangles by cutting squares 9-1/4". Cut each into 4 triangles with 2 cuts. You also need edge triangles to finish out the sides. You need 24 larger triangles for the edge. Cut 6 squares 12-5/8 ". Cut each into 4 triangles with 2 cuts. And 4 smaller triangles for the corners. Cut 2 squares 6-5/8". Cut each in half diagonally to make 2 triangles. Now do remember we have no technical editor here but St. Thomas over on the left so check my math before you cut. Barbara, thank you so much for posting these blocks this year. This has been some serious fun! Thanks for posting the setting ideas. Earlier on you stated there would be more applique and flag blocks, are these coming in the last weeks? :D Glad you like it! I still haven't decided, though. It's either that one or alternating Streak of Lightning blocks. There are some pretty neat setting layouts popping up. I thought I knew what I was going to do but now with all these news ideas, I'm not sure. I'M SO CONFUSED!! Heck what's new. Thanks everyone, and Barbara especially you. I have been enlightened to so much about CW, so appreciated. 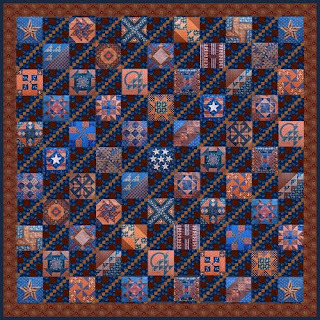 Thank you for the great Civil War Quilts BOW. It has been fun looking for the blocks in BlockBase. I am looking forward to the updated version!! I have finish my quilt today like this setting idea - thank you very much to Barbara for this blog and all what you offered us all the 2011 year along- and thank you to have given the instructions to do this setting idea ! sorry for my english which isn't very good... THANK THANK THANK !! !